Abouda Safar - Who are we? 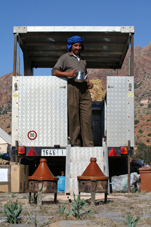 With our wide selection of tours we try to allow you an extensive and fascinating insight into Morocco's hidden secrets. Regularly we improve them through better knowledge of the region in terms of landscape and cultural wealth. This enables us to present you even the most hidden jewels of Morocco. Since the foundation of "Abouda Safar", we had the pleasure to welcome many riders from all over Europe, which have since become fans of Morocco. Many of them faithfully return each year to discover a new area, never tired of exploring this beautiful country. Abouda Safar offers various types of accommodations: comfortable camps, homestay with inhabitants and sometimes small country hotels. This guarantees maximal comfort while maintaining the freedom to visit even the most remote areas. 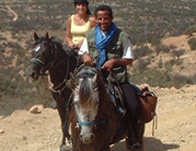 From experience we found that this retains the spirit of the journey on the horseback and as well provides the comfort many riders have rightly enjoyed in Europe. We must nevertheless bear in mind that Morocco is not Europe and that the environmental conditions sometimes force us to make some concessions, for example, saving water in desert areas. This is also the attitude local people expect from us.  Our major goal is to present you the most beautiful areas of southern Morocco and at the same time enable you to meet and exchange with local people.  Often we use uncharted paths, which are often only accessible by foot or on the horseback to reach even the most hidden "secret gardens" of Morocco.  To make a deeper contact and exchange with our guests really possible we always move in small groups. This also inhibits a "tourist invasion" of these rural and quiet places.